I gave Mommie this card for Mother's Day. (courtesy of my friend Hana the Eskie and her Mom and Dad) You can click on it so you can read it. So today she took me to Petsmart so I could go shopping. 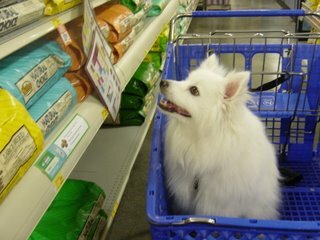 Here I am checking out doggie food. Hey Mom! 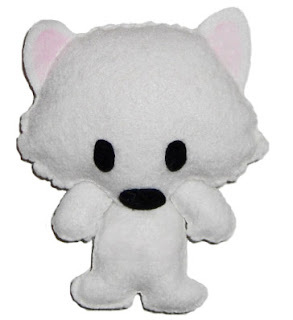 I want to get this PupCorn. It's low fat, low calorie, low sodium and cheese flavored! 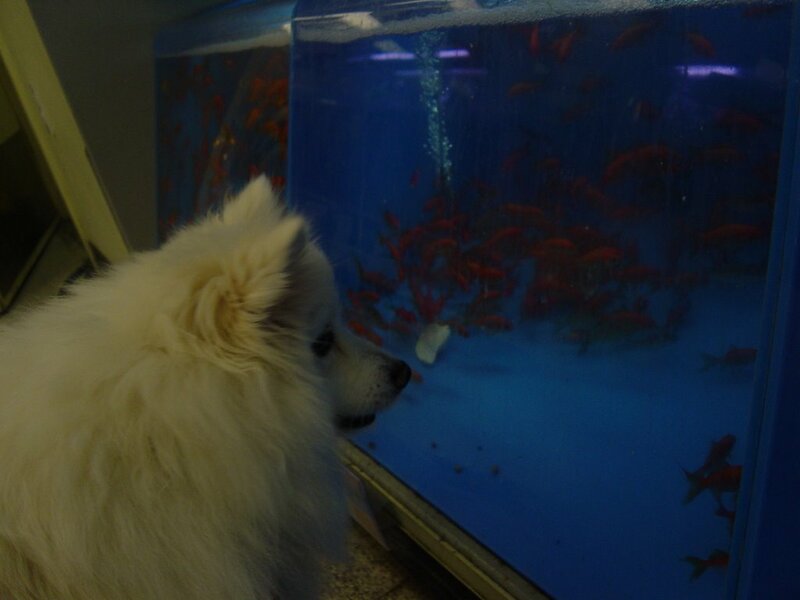 Now let's check out some fishies for you. I know which ones we should get. 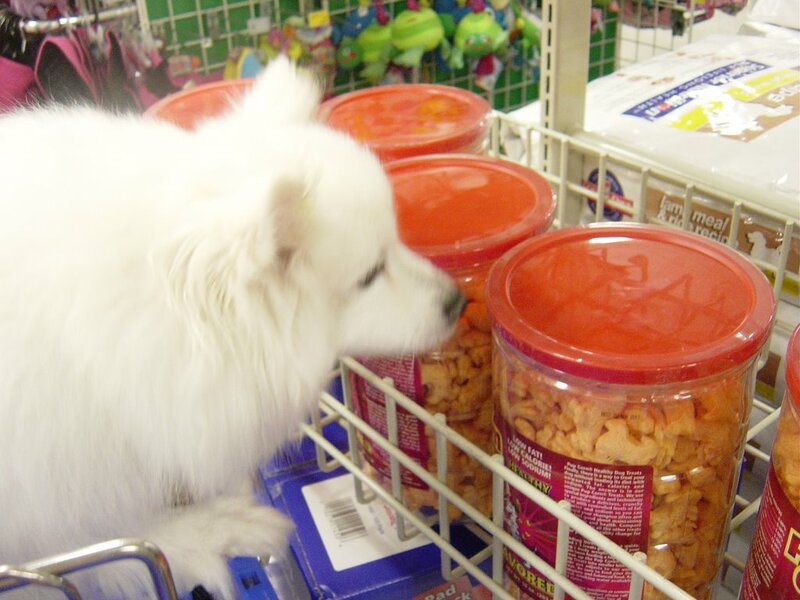 C'mon let's find the sales person so we can get our goldfish. I got this one, Mom.It's my treat! Mommie thought she saw me outside last night at the mailboxes. A man was walking with an Eskie in tow. She thought I was doggie napped for a second coz the Eskie looked so much like me. 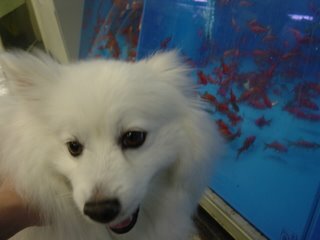 But when she approached them, it turned out to be a girl Eskie named Muffy. She is 14 years old. Wow! They live nearby. Too bad I was not with Mom. I would love to have met Muffy. I sniffed Mom when she got home and knew at once she'd been patting a doggie. Oh well, gotta concentrate on getting better so I can go for walks again. 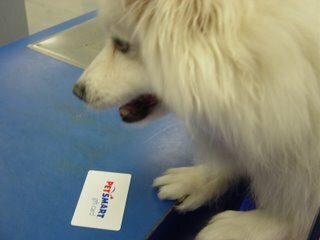 It is a blood test day today so Mom will take me to Petsmart later on as a treat. Wheee! Here are pictures from the Norcal Spring Eskie Meet. I am really bummed I was not able to go. Look at all those white fluffballs. How fun! They are planning another meet and greet in September. Oh I hope I will be able to go then. 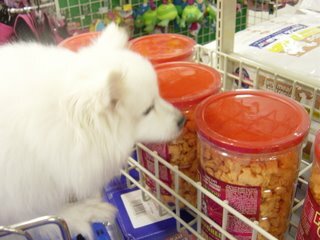 I really want to see and sniff all the Eskies. My PCV and platelets dropped again so my doctor is increasing my medication. Darn! The people on the Eskie message board are having a meet on Sunday. I won't be able to go coz my PCV and platelets went down again. Such a bummer. I was so looking forward to seeing everyone. I am now back down to 39% and Mom is just devastated. Since this is my second drop in a row she is afraid I might relapse. I sure hope not. This Evans Syndrome is a real nasty thing. When we went to the doctor, I tried to get into the car on my own but I did not make it so Mom carried me in. And the hunger is really getting out of hand. Mom says I look so crazy coz I get wide eyed and keep jumping and panting and clawing at her to get food. But I am so hungry I cannot help it. She feeds me so much food and yet I am still hungry. My tummy has become a bottomless pit. The people on the AIHA message board said this is because of the prednisone I am taking. Some of them call their doggies Hoover coz they just eat everything in sight. Haha! I gulp down my food so fast, I do not chew it anymore coz I am so hungry. Since I cannot go for a walk, Mom takes me for a short drive in her car so I can get out. Usually we go to the post office but sometimes she just drives me around.